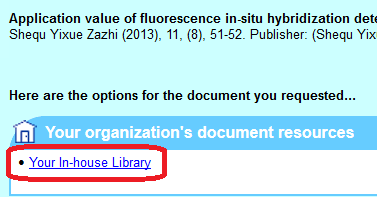 SciFinder’s “full text” link is now called “other sources”. If you’re a SciFinder user you may have noticed a recent change to SciFinder’s “full text” links. We’ve changed the set up of this feature to make it easier to check Heriot-Watt’s subscriptions. On the SciFinder results page, click on the “full text” link immediately below the article’s title. On the next page, click on the link for “Your In-house Library”. This “in-house library” link will check the Heriot-Watt subscriptions, and tell you if an article is available online. It should give more accurate information compared to previous the “HTML” and “PDF” options, so you should use this new link to check for full text access. SciFinder is an index to scientific literature about chemistry, chemical engineering, and biochemistry. It also provides chemical property and reaction information. If you have any questions about using SciFinder, please contact Kirsty Thomson.